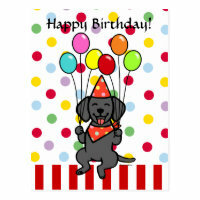 I love the Labrador Retriever. 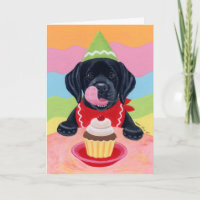 I own a handsome black Lab myself. There is just something extra special about the Lab. I don't know if it's the soft ears, the thoughtful expression, their intelligence or just there desire to work hard for you. Anyway cutest of all are Lab puppies. 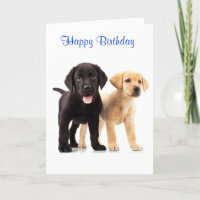 Labs come in three types, Yellow, Black and Chocolate. 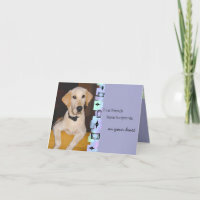 I am biased towards the black myself, but probably the best for photographs are the Yellow, sometimes called a Golden Labrador - not to be confused with a Golden Retriever which is a totally different dog breed. 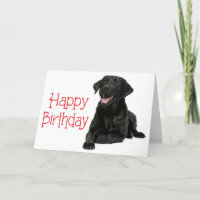 Sadly for me my black Lab is so black that he often disappears in a picture. 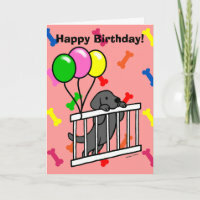 So let's take a look at some yellow Lab puppy birthday cards. 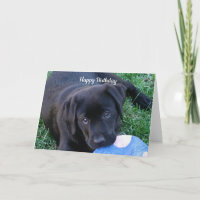 So there you have some ideas for birthday cards with Labrador Retriever puppies on them. 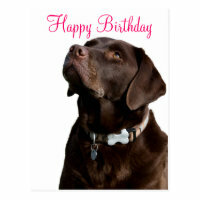 Forgive me for adding one little extra picture, it is of my Lab, Leif on one of my own best selling cards.